Students and staff at Circle of Peace School are delighted to have a second rainwater harvesting system at their school. This system, installed in March 2011, is supplying the water primarily for showers. 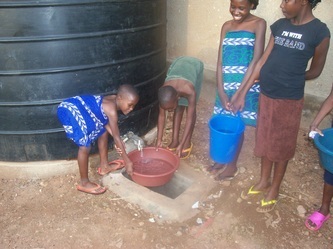 Another system, installed in June 2010, is providing water primarily for the latrines. The second system met an urgent need. “Water is expensive for the school and the rain water harvesting system is the only solution at the moment,” School Director Morris Bbaale told AHEAD staff when they visited the school in December 2010. “Bath water is too heavy for students to carry a long distance,” he added. The second system is made possible by the Presbyterian Church of Webster, New York, which selected AHEAD Energy as its second mile giving emphasis for three years.